Coconut oil has been used as a beauty treatment for centuries. It not only benefits your outward appearance but when taken internally as cooking oil, coconut oil can also have very positive effects on your overall health. Coconut oil can aid in lowering cholesterol, losing weight, strengthening immunities and treating infections. Full of antioxidants, coconut oil also possesses antiviral, antifungal and antibacterial properties. You can consume coconut oil directly, use it to cook food or apply it straight onto the skin and hair as a beauty treatment. It's the all-purpose, super product. Coconut oil in one of the most commonly used household product which is seen in daily use for various purposes, like household cooking, skin treatment, nourishing hair and body, it’s a versatile as it gets. Coconut Oil has numerous applications in industry, food items and beauty products. It has a very high saturated fat content hence it has doesn’t easily oxidise and has a longer life of up to 2 years. But it also has pros and cons of having such high saturated fat levels, cons being so much consumption of high level of fat consumptions is harmful for the body, but since the consumption is in our control it can be used only for the benefits of it. 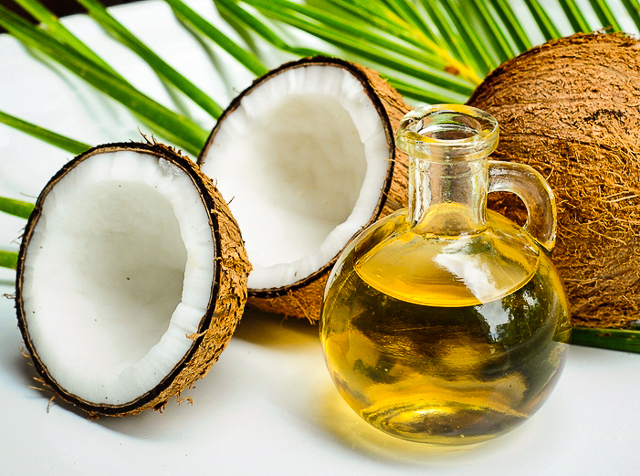 Coconut oil has been being used as hair oil for a centuries, and it has proven results in hair treatment. Coconut Oil has helped in keeping the hair strong and nourished. It also has protected hair from premature ageing, hair loss or baldness. Below are some benefits of coconut oil for hair. Using coconut oil is one of the most efficient ways to grow hair quickly and make them strong and beautiful as well as shiny. 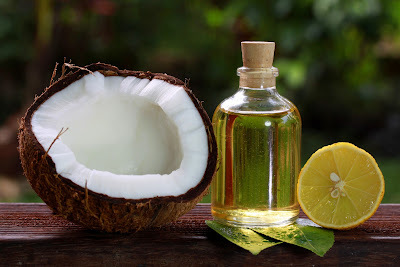 There is no such particular method that needs to be followed for applying coconut oil but the following method is counted as one of the most effective ways the oil improves your hair. Gently rewarm a jar of coconut oil in warm water. It appears solid in the jar, but melts when heated. Avoid using a microwave as it can damage and alter the chemical structure of the oil. Hair should be moistened with slight warm water before applying oil, as it opens up the pores of the scalp. Take one tablespoon of the warmed coconut oil and place into your hand. Begin to apply to your hair. A good rule of thumb is to use two tablespoons for shoulder length hair and up to four tablespoons for longer hair. Apply the coconut oil directly to the roots of your hair by using your fingertips. Take some of the warm oil in your palms and rub your palms against each other to generate heat in the oil, now apply the oil directly on the roots of hair. This leaves the end of your hair strand nourished and shiny. Massage your scalp with the oil, move your fingers in circular motion which ensures all the blood vessels get nourished with the benefits of this oil. Don't worry if a few strands of hair fall out, as this is normal during the massage process. Use a shower cap to cover your hair and let the oil reach to all the hair follicles and show its effects. Twenty to thirty minutes is the minimum. If you have the time, leaving the shower cap on overnight will provide the best results. After waiting for an optimum amount of time wash off the hair using natural shampoo which has less amount of chemicals, and using conditioner after shampooing won’t be necessary as coconut oil itself is a conditioner in itself and it will leave your hair stronger and shinier. Coconut oil can nurture and repair even harshly damaged hair. Heat from products such as blow dryers, straightening irons or curling irons and chemicals from hair dye, shampoos and styling products cause hair to lose much needed proteins that keeps hair strong. Damaged hair is often brittle and dry due to a loss of natural hair proteins. Coconut oil contains these hair proteins and can provide complete nutrition to the hair follicles to make up for the proteins they have lost. Make the oil slightly warm and apply into the scalp and hair, working from the top down to the bottom. Leave the oil for about an hour then rinse gently with an herbal shampoo. You want to be sure it is a shampoo that does not have the harsh irritants that caused the damage to your hair in the first place. 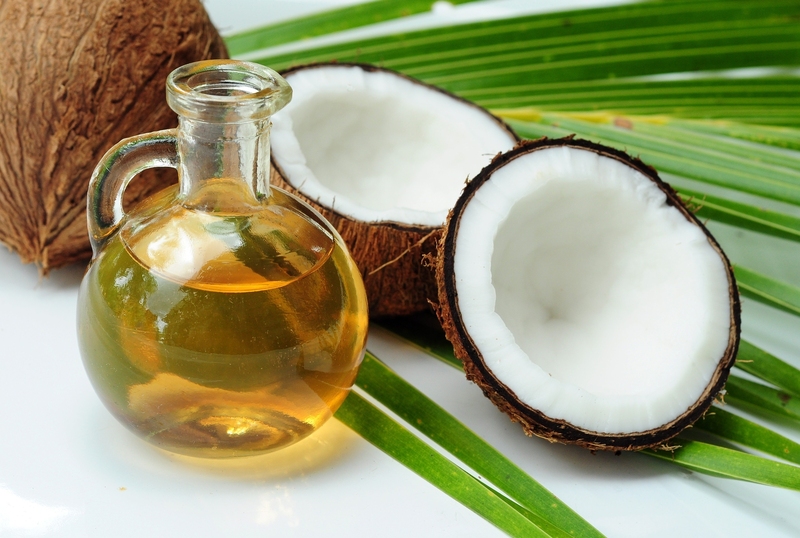 Coconut oil has been used since ancient times in India for grooming hair. Various remedies were prepared using herbs and coconut oil to prevent hair loss. One such remedy can be prepared in modern times by boiling sage leaves in coconut oil. This mixture can be applied to the scalp for the improvement of healthy hair, and its use will also prevent hair loss. It can cool and relieve individuals with hot heads, or the individuals who experience the ill effects of serious scalp sweating. The use of coconut oil on the head and scalp likewise has a cooling impact. Since it cools the head it is more of used during summers to keep a cool head and in winters is mostly used to keep the scalp nourished and prevent it from drying. Using warm coconut oil helps in keeping hair soft and shining. Coconut oil is a better conditioner for hair than any other available in the market. The conditioner available in the market works from outside while the coconut oil works from inside out and deeply condition the hair, leaving your hair smooth and silky. It helps in regrowth of damaged and dull hair by stimulating blood circulation in the scalp. Apply some warm oil during the evening and wash your hair the following morning. This can be used to make hair more strong and shiny. Lice are a very common pest found in the hair and can cause embarrassment for anyone. They also have a tendency to come back again and again. There are many chemical products available for the treatment of lice, but unfortunately, they can also damage the scalp and hair due to their strong chemical components. Combing wet hair with a fine comb is a good remedy for getting rid of lice but this may also damage the wet hair. However, if one coats the wet hair with coconut oil, it becomes much easier to comb and subsequently remove the lice. Its normal to loose hair strands everyday. It also regrow as a natural process. But the problem arises when you see lot of hair fall in one go or your head start becoming bald. Since ancient times there have been different remedies for preventing hair fall, baldness was treated with usage of herbs and now is the times where baldness can be treated also with highly scientific operations such as hair transplant. But in these changing times one thing that still prevents this in same old way is by using coconut oil. The nutrients and natural antioxidants in coconut oil helps in boosting hair growth as well as its regrowth. Visit hairlossrevolution.com for more information. Mix lime water and coconut oil and apply it on hair and scalp. It will help in preventing hair loss. You can also use a mixture of Coconut oil and gooseberries. Heat up the gooseberries in coconut oil and afterwards apply it on the hair. Coconut Oil is one of the best known natural Moisturizer for hair and scalp. Its rich in fatty acids which helps in nourishing and moisturizing the hair and scalp. It also has a high moisture retention limit, it is not easily broken nor evaporated, being exceptionally steady. It doesn’t let moisture escape, in this way it keeps hair wet and soft, hence using coconut oil before and after shampooing plays a major role in avoiding hair loss. You can also add other essential oils like Jasmine Oil or Honeysuckle Oil with Coconut Oil. It will give a pleasant scent to the oil. The utilization of coconut oil on hair helps provide the much needed protein in both damaged as well as undamaged hair. Coconut oil is rich in lauric corrosive, and has a high quantity of hair protein; the oil easily enters into the hair pores into our scalp, which is because of its low atomic weight. So it can be used as a pre-wash preparing agent as well as post-wash preparing agents. Coconut oil can be a good styling oil for hair as well, as it melts on heating and then condenses when cooled. Therefore, when you apply it on your hair, it thins and spreads evenly due to the heat of the scalp. Soon afterwards, as the hair comes in contact with air, the oil on the hair condenses, thus working as a styling gel or cream. Coconut oil has highly saturated fat content which on regular usage helps remove dandruff from the scratch. Normal use of coconut oil can help you resolve the dandruff issue until the end of time. Mix some amount of coconut oil and castor oil in warm water and apply it in hair. Many times using a variety of shampoo to help meet you requirement doesn’t really fulfil it. This is due the fact that shampoos leave your hair dry, faded and unpleasant because of it chemical properties. So going around in market looking for shampoo’s claiming to solve this issue is really worthless as they are not natural and will leave your hair dry and hard. The oil in cleanser counters this impact; coconut oil has fat content characteristics which leave your hair smooth and shiny. The oil doesn’t really make your hair oily or sweaty, regular usage in proper doses will only leave your hair oil free and shiny, but do make sure to wash off hair properly after application of oil. One amazing feature of coconut oil is its fragrance; it has a very sweet and invigorating scent which also enhances the smell of shampoo after usage. Hence using this not only helps hair naturally but also keeps your senses relaxed and calm. Hair conditioner is one of the many products coconut oil can be replaced with, since it has almost zero chemicals in it, it’s one of the most effective way to condition hair. Mix some henna and coconut oil and heat it till it forms glue like substance. Apply this mixture and leave for twenty to twenty-five minutes and then wash it off, do not apply any other conditioner, this itself will leave your hair silky and shiny. This remedy is a boon especially to the ones with very dry hair. Coconut oil also helps in the toning of hair, especially dry hair. Apply a warm mixture of coconut oil and lavender essential oil on scalp at night, then wash and rinse your hair the next morning. You may repeat this as frequently as you want until you see your desired results. Trimming off hair again and again due to split ends is no doubt healthy but can also be frustrating to someone who wants to grow out their hair. Rather than having to have them cut off why not do something which prevents the formation of split-ends itself. Here’s what you can do, massage your hair with a mixture of coconut oil and almond oil for a couple of minutes; this will help in minimizing the split-ends and also helps them bring back together. Some people experience the condition of boils on the scalp, especially during the winter. This may also happen if exposed to heat or sun for a long duration. It is important to keep both the hair and scalp clean, and occasional massaging of the hair with a mixture of coconut oil and olive oil may provide relief from the uncomfortable and unsightly problem of boils. However, if the problem persists, it is advisable to contact your health care specialist. For people with dry hair that is rough and thin, taking good care of your hair is a big concern. However, using strong hair care products for cleansing, toning and conditioning may lead to a dry and flaky scalp. Coconut oil can be effective in taking care of this sort of dry hair. Coconut oil is equally useful for reducing hair loss and prevents greying of hair. Blend Bhringraj or Eclipta Alba leaf juice into coconut oil and apply this on the scalp and hair. Coconut oil is so easily available in market that everyone can have its benefits. Many people also use scentless oil and apply it and move around, thereby procuring all the advantages of a sound head of hair! Among the various properties that coconut oil has such has high fat content, good for hair maintenance high level of vitamin E supplements and also prevents moisture and helps condition hair, one of its feature also includes providing protein for hair, that in layman’s term can be food for hair. Proteins from the oil help strength hair and make them thick and strong; it also cleanses your hair and gives great amount of support. Who doesn’t like thick and strong hair? Think hair is considered beautiful, so use coconut oil and help yourself get beautiful hair. The use of coconut oil on hair helps to reduce protein loss in both damaged as well as undamaged hair. Coconut oil rich in lauric acid, has a high affinity for hair protein, and easily penetrates inside the hair shaft, which is due to its low molecular weight. It can be used for pre-wash or post-wash hair grooming. Many people are unaware of this, but some of the new shampoos have actually tried incorporating coconut oil in its chemical formation, because people have started getting to know that how important oil is for hair and have started using more of it for better hair quality. Earlier using oil in hair was considered to be as of someone from a lower background or someone who is naïve will only do it, but now more of people have accepted this universal fact that it is actually good for hair is not only something that people with less money or a orthodox background can use. Since this awareness has been generated companies have started incorporating this in their products as well. The most well known look was wind-blown, feathery light hair, coming about because of unpredictable utilization of oil-less, burning and synthetic based shampoos. Hence extreme use of shampoo started leaving hair dry and lifeless, therefore oils started to advance into the shampoos and producers started broadly utilizing coconut oil as a part of cleanser. That is when The real producers took in a lesson from the old men and ladies with regular, solid coal black hair living in waterfront regions of India and neigh boring nations who had been utilizing coconut oil on their hair since youth. If you're going to use coconut oil for your hair, be sure you pick up a quality bottle of virgin oil. Use must be consistent in order to see and maintain proper results. This is why it is suggested to add coconut oil into either your daily or weekly hair care routine. You do want to take care that you are not overusing the oil. Applying too much can give hair a greasy and unwashed appearance. It can also clog the pores and hair follicles if you are not thorough enough in washing it out. Avoid hair straighteners. Hair straighteners are commonly used by many people, but are in fact one of the most hair damaging of all treatments. The excess heat dries out your hair and permanently damages it. Avoid over brushing. The repetitive brushing action damages the hair and results in split ends due to mechanical trauma. Brushing a few times a day is fine, but more excessive brushing will leave the hair damaged and unhealthy looking. Remember, a little bit can go a long way and provide you with the care you need for beautiful, strong and full hair.